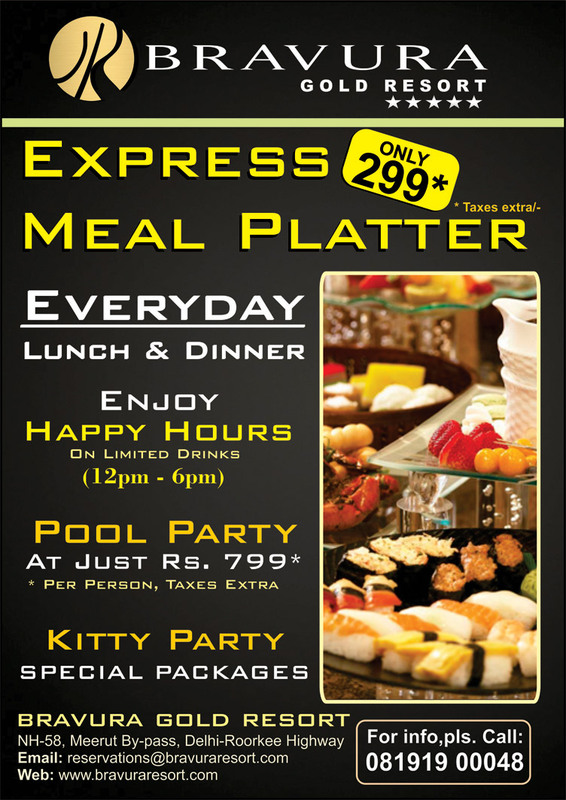 Enjoy Express Meal Platter @ Just Rs. 299/- Per Person* (Lunch & Dinner) on all 7 Days and also enjoy Happy Hours on Limited Drinks (12:00 PM to 6:00 PM). Bravura Gold Resort introduces Pool Party at Just Rs. 799* Per Person. So don’t wait, join us now. To know more details about Express Meal Platter at Just Rs. 299/* at Bravura Gold Resort, kindly send us your request using our Enquiry Form and we will contact you at your convenience. Alternatively, you can also email us directly at reservations@bravuraresort.com or call us at +91-121-7196655, +91-8191079998, 8191900048.